I love subscription boxes. Every time I open the mailbox and find a subscription box inside, I have a “Christmas” moment where I never know what surprise is inside. While there are quite a few snack or beauty boxes out there, the new The Handy Box monthly subscription box is the first box of it’s kind. 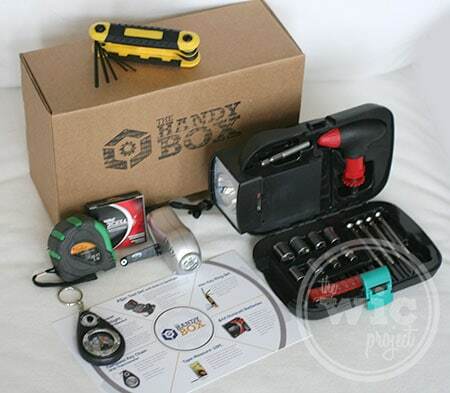 The Handy Box delivers a monthly box of specially selected “handy tools and gadgets.” The Handy Box will have over $40 worth of useful items and is designed for those of us who are just starting our own tool collection or for those who are gaining confidence doing projects around the home. I remember when I first started living on my own, I didn’t even think to have any tools until I started having to fix things. Then I had to figure out what tool I needed and make a special trip to the hardware store, just for fixing something silly, like tightening an outlet plate. 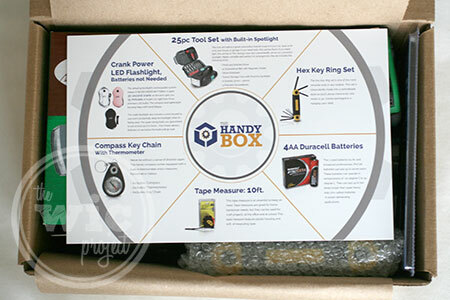 Today, we’re going to be taking a look at the special pre-launch The Handy Box! The Handy Boxes are shipped via USPS mail and arrive in a classic stamped brown cardboard box. You can’t really see it in the picture, but the right side of the box is bulging a bit, so you can tell that this thing was PACKED. Everything inside The Handy Box was carefully wrapped in brown paper and sealed with a super cute cog sticker. The Handy Box also included a product information that described what was inside the box. Once I removed the product information card, I got to see everything that was inside this month’s The Handy Box. Here’s a shot of everything that was in my The Handy Box. 4AA Duracell Batteries – The Handy Box didn’t leave you hanging with the built-in flashlight mentioned above. They included 4AA batteries you can use for the flashlight or whatever else needs batter power. 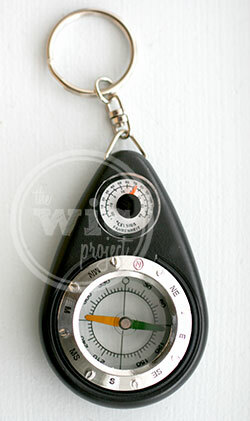 Compass Key Chain – If you think about it, this is an incredibly practical key chain. You can tell both the temperature AND direction, which are things you never think you need to know until you NEED to know. Hex Key Ring Set – I didn’t even realize what a “hex key” was, until Gil pointed out they’re those tools that come with furniture you need to assemble. You know, the ones you lose, then put away for later and then can never find them again when you need to tighten some screws. 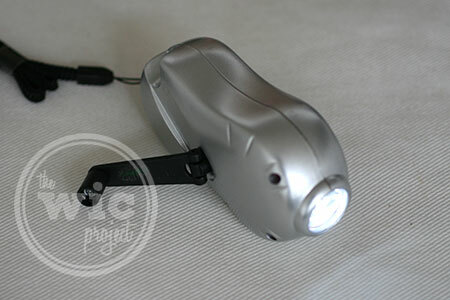 Crank Power LED Flashlight – While I think all of the items in the pre-launch The Handy Box are great, I think this flashlight is my favorite. You turn the crank for 15 seconds and you can get light for up to 30 minutes. You can press the button on the top of the flashlight until it clicks and the light will stay on (until you need to crank it again, that is.) Everyone should have this in their emergency kits. 10 ft Tape Measure – I can’t even count the number of times I’ve scoured the house looking for a ruler or something to measure the size of a box. I think I’m going to hijack this tape measure and keep it at my desk. The total value of this pre-launch The Handy Box is well over the price of the box. 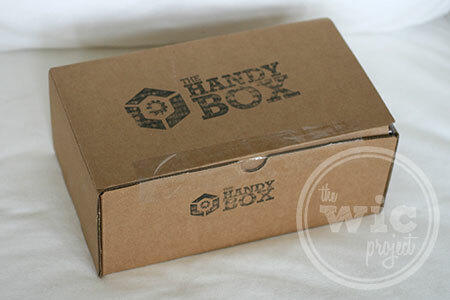 The Handy Box subscriptions start at $24.95 per month ($18.95 + $6 shipping.) The Handy Box also offers 3 and 6 months subscriptions that also give you a discount on each box. I can’t wait to see what’s in store for next month’s The Handy Box. All of the items in the pre-launch The Handy Box definitely fit into their description of “handy tools and gadgets” and I really appreciate how I can actually use everything in the box. 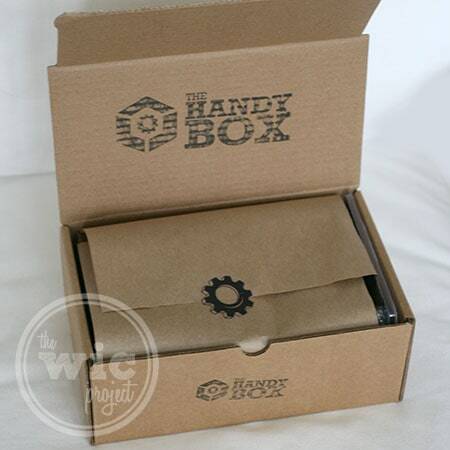 One winner will receive their own pre-launch The Handy Box! This would be super awesome for my husband. He would love it! My son would enjoy it. Well as I live alone, I will say me! I could definitely use this box for myself! That box has a lot of great tools. I think my husband or my father would love this most! If I need anything fixed I call them! Me;) I am tool challenged! This would be a great gift for my daughter to get her tool box started. My husband would like this and so would my oldest son. My hubby & I BOTH would love this! My hubby would love this!!! Our son would like this. I’d like this for my house – my mother and I fixed my toilet last week and she was making fun of my lack of tools. I would actually love to have it for myself. I would love ty this! My stuff always seems to disappear. My mom would love a Handy Box. I would use it most, I’d share with my friends. I would love the Handy Box. I am always doing projects around the house from big to small and always need to find a tool to use, which isn’t always the best one to be using though I make it work. I seem to get the job done, the hard way! Myself and spouse would so love to get as we are always doing home projects and usually have to borrow many of the tools we need from others! What a cool box! I like that flashlight too. I would enjoy the handy box the most. The hubby would really like this! I would love this for my projects. This would be great for my fiance’ ! There are always tools we can use around the home we may need to borrow from neighbors. Oh, I’d love to win this for myself. I’m always doing little projects around the house (with the occasional big project) and just don’t have the tools I need for everything. This is such a great idea! It would be a great gift for newlyweds, children moving out on their own, and pretty much anyone. I think I would like it more than the hubby. Lately, I’ve been doing more handy-man work than he is. I would probably like this the most. I could use this; we left most of our tools for my son when he bought our house. I would be the using The Handy Box monthly subscription box, cuz I am the one always (trying) to fix things around the house. I could use it myself. My husband would enjoy it. My husband loves these things-it will certainly get used in our house! My hubby would love this box! I see Father’s Day in the future for this great box! My boyfriend would love the handy box! everything in the pre-launch box is something he would use all the time, and getting the box is so much easier than trying to decide what tools and gadgets to buy him every month. I think he would love the excitement of getting the box and seeing what’s in it every month. My husband and I would both enjoy this box very much! Hi! What a cool idea for a subscription box. 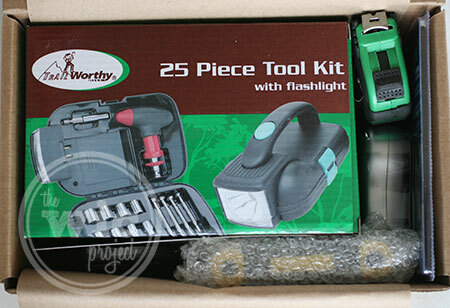 My favorite item is the 25 piece Tool Set with Built-in Spotlight. As I live alone, this would come in very handy! Thank-you! I think my fiance would love it. This would save me the embarrassment of asking my husband which of his tools to use for my quirky projects. My husband would think this is awesome!! As a single mom this would come in handy. 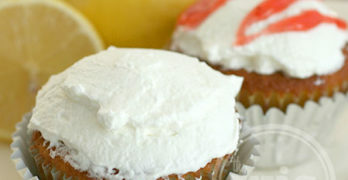 My hubby would enjoy a subscription to Handy Box. He loves all sorts of gadgets and tools. I think I’d enjoy it the most. 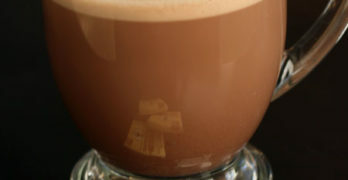 I would like this for …. ME! I could really use the box. My husband would absolutely love this. He is the perfect handy man! I would love it but my son would probably abscond with half of the tools. I would love it the most! I think my Husband would love receiving The Handy Box. Thank you for another super giveaway opportunity. Please continue with the terrific blogging. My dad would love the Handy Box! Hmmm….I would prob share it with my sister….we both love gadgets. This would be a perfect surprise for my better half, retired now and puttering around every where! I think my husband and son would like this! I would love it the most until something in it was needed, then they’d all love it. I would keep this box for myself. I think I would like the Handy box the most! I seem to do more of the “fixing” up since I’m home all day! My husband! He is always fixing thing or replacing things in this house! Both my husband and myself would love it. We both do handyman type stuff around the house. I wold love this.I do most of the repair work around here as my husband is always at work lol.My 11 yr old son would most likely try to permanently “borrow” some things in the box. This would be something my hubby would enjoy! My fiance would love the box especially since we’re closing on a house. I would love the handy box!! I think I’d get the most use out of it. This would be great for both me and my husband! We definitely need more tools, I feel like we’re constantly borrowing for our DIY projects! I would love it 🙂 I would def get the most use out of it. I would- I need it for the projects around the house!